This painting comes from our vacation in Hawaii last year, where we enjoyed some time on Maui as well as Kauai. Napili Bay is a lovely lagoon on West Maui, a little north of Lahaina. It features a beautiful soft sandy beach, tide pools, shallow water for wading and excellent snorkeling. 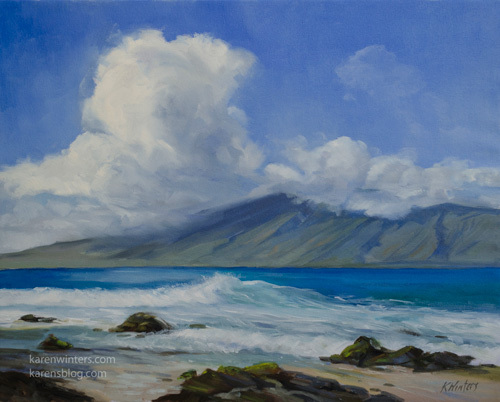 Across the bay you can see the island of Molokai, which I featured in this painting. I’m guessing that this is a popular wedding destination, it’s so beautiful. What attracted me to this scene, other than the gorgeous turquoise water, was the huge thunderhead which was building up over Molokai.